Creating a beautiful space isn't just about the house itself. Make sure that your home's "accessories" are up to date and well-kept. This can include items like the mailbox, house numbers, planters, etc. While the viewer's eye is mainly drawn to the house itself, they may be seeing your space from all the way down the street if an interesting mailbox draws their eye in either a positive or negative way. Don't forget to keep these items up-to-date and looking their best! Most viewer's eyes are drawn to the doors of a home, as they serve as the entrances and therefore the first thing on someone's mind who may be visiting or even just driving by. 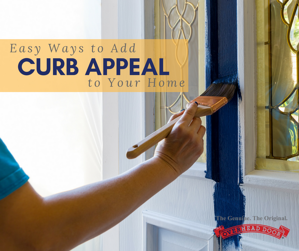 Adding a little bright paint to the front door or garage door that goes with the other colors of the home can really make your house stand out and bring some charm that makes your house memorable and inviting. Your beautiful home deserves to be seen all day and all night! Create a welcoming space at any time of the day by replacing or adding exterior lighting. Replace dying bulbs with lights that offer a more natural white light and, if certain parts of the exterior could use some illumination, don't be afraid to add a new lantern or wall light! Your home's curb appeal is important, and no company knows that better than Overhead Door of San Angelo. Contact us today to find out how we can help you to create the beautiful home of your dreams and increase it's curbside appeal.